We reserve the right to make small adjustments to the schedule. 12:35-13:05 Lunch Lunch Lunch End of conference BBQ. Place and time will be announced on short notice. At this point, we'd like to point to Jim Davenport's gender study website that collects crowd-sourced information on the gender of speakers, chairs, and questioners. Information from previous Cool Stars meetings has been published in the Cool stars 19 proceedings. The conference venue (George-Sherman-Union) has food court and other amenities (banks, ATMs) on the first floor (for non-US speakers: ground floor). 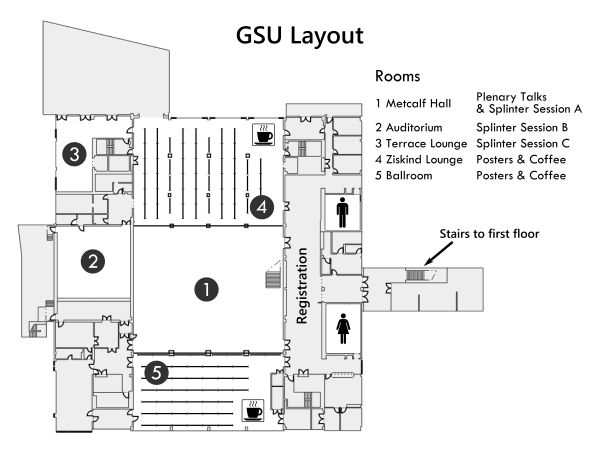 We hold the conference on the second floor (non-US speakers: first floor) and a plan of the rooms on that floor is shown below. Starting with our own solar neighborhood and moving to greater distances using luminous stars, what have we learned from the current programs and what will be accomplished in the future? Do these surveys provide quality information needed for modelers and theoreticians to address many problems in stellar evolution, star formation, cluster formation, disk/halo/bulge formation and evolution? Our Sun and stars interact with their surroundings through radiation and plasma. Stellar winds span almost 10 orders of magnitude in flux. Transient events - violent coronal mass ejections and flares - produce both enhanced radiation and particles surrounding a star. The environment can interact with stars as well via the process of accretion. Can we quantify the characteristics of these events and define how these processes change as a star is formed and evolves? From asteroseismology of stellar interiors to construction of stellar atmospheres, the physical parameters of cool stars remain fundamental quantities of astrophysics. Our understanding is being refined by new capabilities. Measurement of masses, radii, abundances, rotation are required for stars in the field and in clusters. Understanding of stellar evolution, interpretation of complex color­magnitude diagrams, and characteristics of exoplanet hosts are among the topics that benefit from improvement of these quantities. Magnetic fields remain fundamental to the evolution of stars and to their atmospheric structures. A magnetic dynamo drives stellar cycles which in turn affects magnetic field configurations and the angular momentum evolution of a star. How do surface phenomena – such as star spots and flares – change with stellar mass and evolutionary stage? How can we prepare for the arrival of the innovative solar telescope DKIST, which will offer unprecedented spatial resolution of the surface of the Sun? Low mass stars and brown dwarfs present one extreme of stellar physics that becomes more prominent as exoplanet hosts. These objects can harbor very cool and puzzling atmospheric structures and behavior. What do we know about their magnetic structures and flaring activity? What are their fundamental parameters such as mass, abundances, atmospheric structures? Conference attendees are invited to join us for a panel discussion about careers for astronomers outside of academia. Astronomers are typically familiar with a large range of skills that can be applicable to the private sector such as: remote sensing, instrumentation, machine learning, analyzing large datasets, spectral analysis and finding creative computational solutions to unusual problems. The panel, composed of former astronomers who now work at various companies in the greater Boston area, will discuss their transition to the industry and some of the unique problems they are responsible for solving. Attendees will learn what type of skills to employ in their astronomy research that can also give them experience for a career in industry if they decide to transition out of academia. The event will include a question and answer session as well as a short meet and greet to allow individuals to interact directly with panel members.